Ah, “The Doctor’s” definitely in! As reigning MOTO GP champion Valentino Rossi recently completed testing a Ferrari F2008 at Mugello. And although the Doctor was full of (himself?) his usual bravado; claiming with a little hard work, he could become an F1 challenger... 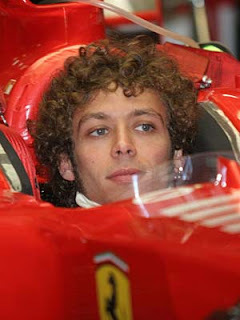 But with his lap times being two seconds behind Scuderia Ferrari Marlboro’s team drivers; I don’t expect to see Rossi in the cockpit of a Ferrari F1 race car anytime soon! That's a really cute !! Thanks, I'm glad you found my site and hope you will continue reading and enjoy it!